Josephine Shabby Chic Cottage is one of the shabby chic cottages like the one in my How To book. Except, I raised the 2nd floor by 1" so the bedroom could be taller. The house is 17 3/4" tall x 11 1/2" wide x 16 3/4" long. The exterior is covered in scrapbook ridged cardboard painted white. 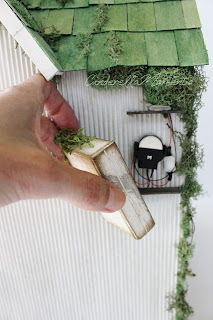 The little box on the side of the house with a nest painted on it is where I put the battery and switch. The link for the light kit is on my "Resources" page. I put a purchased door and a window in this house. 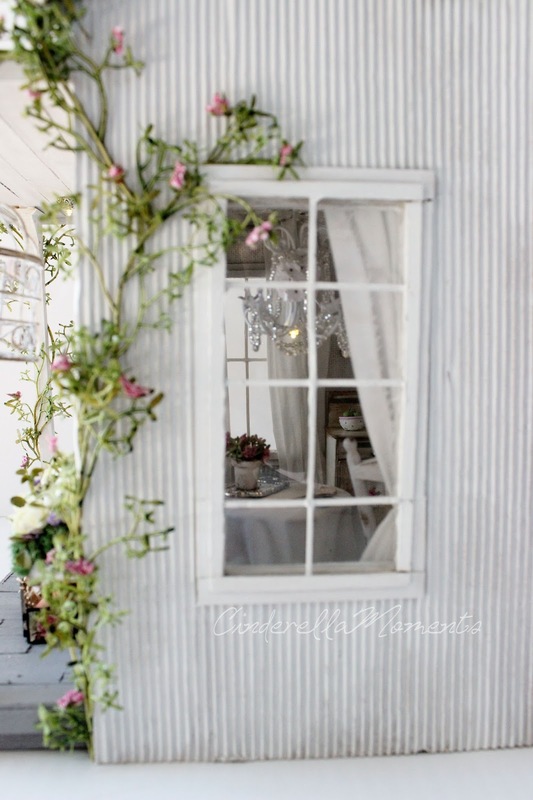 The 4 other windows are handmade. That little cage is from Hobby Lobby. 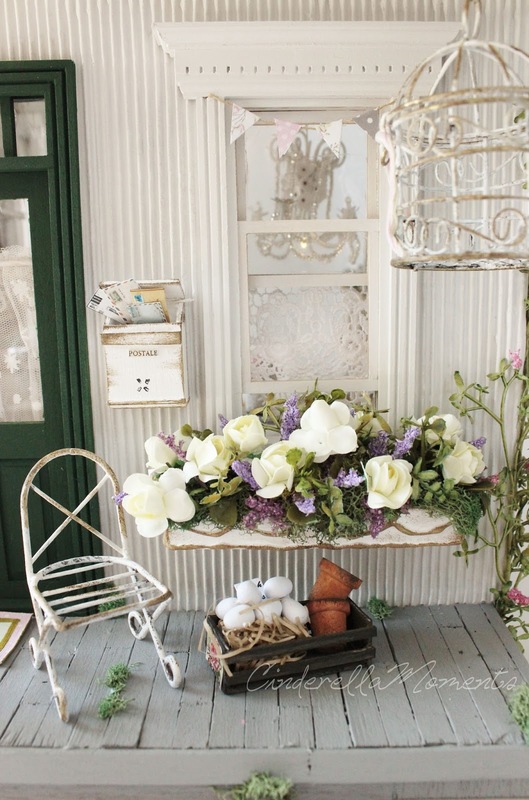 And the chair is from a fairy garden set. I made the mailbox like the one in the Shabby Chic Trailer. 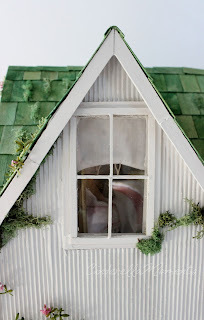 The window box is decorated with hot glue, painted and aged with brown ink. 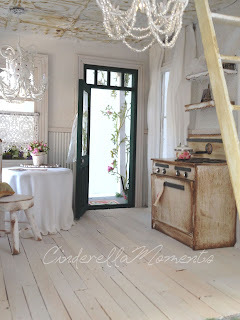 Inside, I have a stove, table and chair, mantel, and bedroom area. I made the mantel with 1/16" bass wood. The tin tiles are hot glue designs. All the curtains and tablecloth are sprayed with hairspray( a LibertyBiberty tip) so they look the way life size fabrics look. Everything is aged with a brown ink pad. 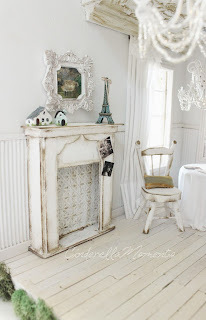 I have a tutorial for vintage stoves on my tutorial page. The door opens into the room rather than to the wall. When it's open it makes like a little entry hall. A tiny little detail. But different! 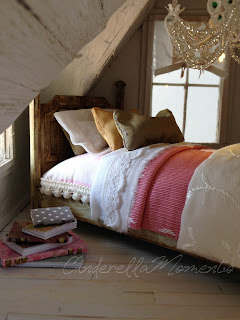 I made this bed from a real life one I saw on the Layla Grace website. It was called the Josephine bed. That's where I got the name for the house. I made two of these beds but with different finials. The other is listed in my Etsy shop. I glued down the bedding. The pillows are not glued down. They are filled with candle sand to make them stay properly on the bed like real pillows would. 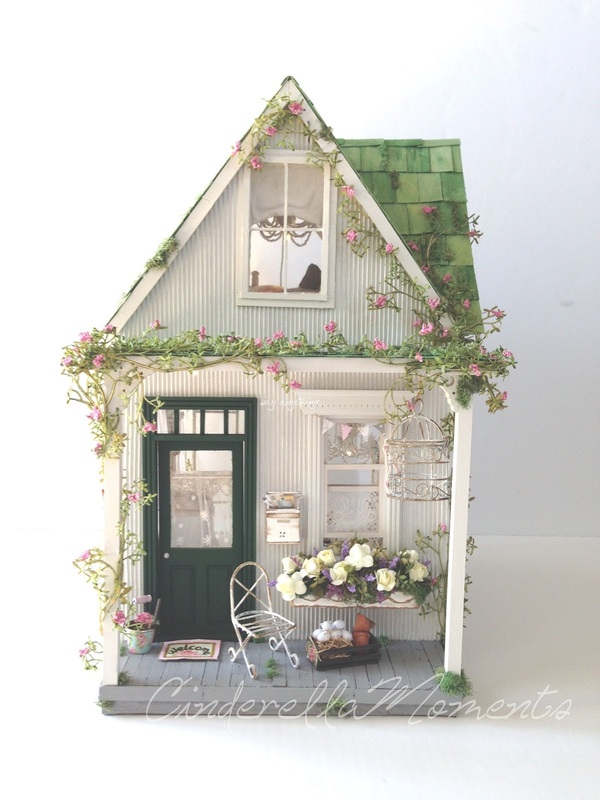 This dollhouse is available in my Etsy shop. Thanks so much for coming over! The house looks so perfect. Everything is just so cute. I have been experimenting with filling my pillows and have settled on quinoa since I can't cook it so that it tastes good. When I run out, I will try candle sand. It might be finer and hold shape better. I have passed on the bird cage at Hobby Lobby thinking it was too large, but do like how you have antiqued yours. Very nice work, Caroline. Gorgeous! I love seeing new posts from you. This house is fantastic, it almost makes me like my own green roof on our real life house! Es increíble el ambiente que llegas a crear tan romántico y decadente a la vez! Parece tan fácil! Pero no es así, se trata de un gran trabajo, te admiro. Adorable! 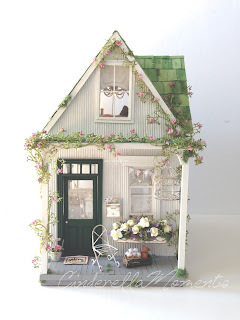 I just love the small house. YOur dollhouses always make me dream. Ohhhh!!! Admiro esa capacidad que tienes para transmitir tanto encanto con todo lo que haces! 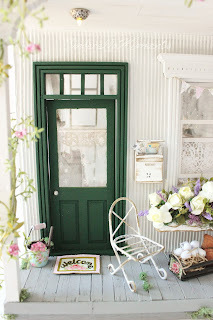 Es una casita adorable! Such a delightful wee cottage. All of your builds seem to touch my soul :) They just transport me to a time of relaxed elegance and there's something carefree about the atmosphere they have. Just lovely, thank you for showing your pictures. 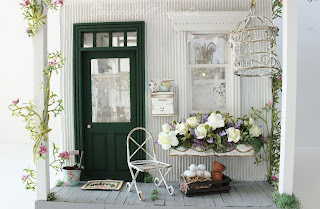 Oh, what a sweet cottage, I love it! 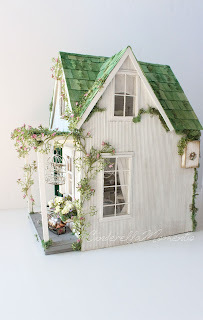 Another beautiful little house! So many good tips, too, from the hairspray to candle sand. 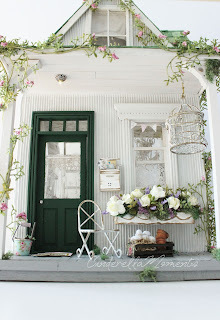 I want to create a place like that porch - life-size - when I get to my new house! I've always wanted a dollhouse, this one is fabulous! Thanks for sharing. Ooooooooooooh Caroline!!! You just keep getting better! This is truly amazing! I love how light and bright it is:) I'm going to attempt doing lighting on my next one! Muy bonita. Queda encantadora la habitación superior con esa preciosa cama. Que gran trabajo haces con cada nueva casa,es increíble,con un aspecto tan romántico y particular...tiene tu sello personal,enhorabuena por ésta nueva creación!! This house is a dream. I love it! Wow! Carolina, it's beautiful! 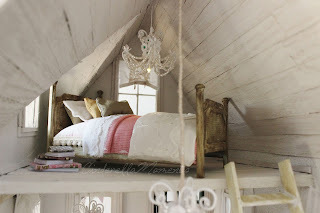 I love, as always all the details, the original of each of your houses ... incredible work! Congratulations. Вы сделали очередной шедевр! Так уютно, так прекрасно! I love each of your little houses! Beautiful as always. :) Thank you so much Evelyn! 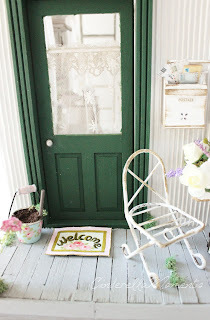 Fabulosa como todas tus casas, me ha gustado mucho el tejado verde. Another wonderful gorgeous house to fall in love with. 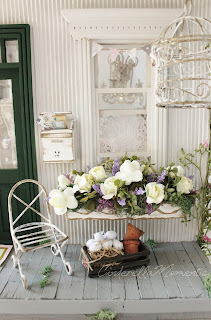 I love the window box and the so relaxing porch. Hi Caroline...Josephine is amazing, a work of art and a labour of love for sure:-)...As always it's all the little details that l love most. The front view of the cottage is so shabby pretty with the teeny table setting and birdcage in front of the grand window and flower box. The vines "growing" up the verandah posts really bring your cottage alive. Inside is just as amazing....Especially the ink aged furniture, the fabulous Frenchy bed with the candle dust filled pillows which makes them sit so well. 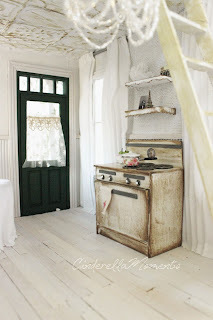 The tin tile ceiling in the kitchen is just magic....it's so wonderful and inspiring to share in your vision and creativity. Beautiful! I always enjoy the Shabby Chic style :) That's a great idea to put candle sand in the pillows to make them sit better! Luv the white and green combo on this one! Astounded how quickly u made it. It seemed like just yesterday I was admiring the trailer. Hope this finds you doing well sweetie. We need to visit each other more often.......I have missed connecting with you. Another charming creation. 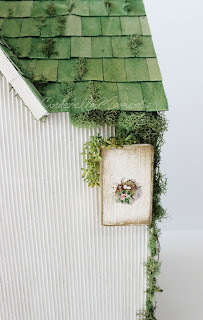 :) I love the green roof tiles, they look really nice with the green vines. The bed is really cool too and looks nice and cosy.